Recently, I came across an online discussion where one of the mothers pointed out that we so often complain about parenting – I’m so tired, the house is always in a mess, the kids whine a lot and refuse to eat, I’m worried about their studies, etc. It’s true but what makes us love being a mom. What inspires us? What makes us happy and gives us the energy? I gave it a thought and here is my list of things that makes me love being a mom. I’m happy to share it with you today. When Little Edison was born, I was struck with how small he was. His little fingers and toes! His tiny nose and ears! Now, he is 5 years old, extremely active, enjoys talking and loves to ask questions. It’s been a joy to watch his amazing growth over these years. Sometimes, it does help to look back and appreciate what we have accomplished and remember how much fun we had during the process. I play hide-and-seek and dance around the house with him. The Hubby crawls on the floor and hides in corners with his gun, pretending to be an army in the war with him. These are the things that we didn’t do before we have a kid. There is so much joy in those guffaws. And we get to do them as often as we like now! I love showing off pictures of my son. Well, who doesn’t? His pictures are spread all over this blog, in my office, on my cell phone, in my laptop and many photo albums at home. They are therapeutic. I like to pull them out occasionally and go ‘ooh and aah’ over his bright smile and charming good look. I like to see toys either in an organized state or chucked all around the house (I don’t mind that!). They give joy to the young ones and they add fun to their games. When visitors come to my house, they often thought that I have at least four kids, judging from the amount of toys that we have. Toys add fun to my household, making it more visual, playful and engaging. Before I get married and have child of my own, I never knew how much work being a mother really is, and now I gain a deeper appreciation for the woman who played that role in my life. I really do admire her ability to juggle so many roles in the past, and I treasure her even more now. 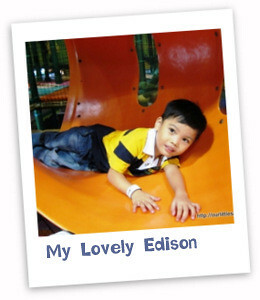 Because of Little Edison, I have hope in the future. The world will no longer be a dark and negative place. I am thankful to those twinkling bright eyes that give me more lights ahead. I love the kisses and snuggles he gives me every day. I love being able to play and have fun with him all day long. It’s so exciting when I witness him reaching yet another milestone in his life. With these being said, I am truly honoured to be a mom!